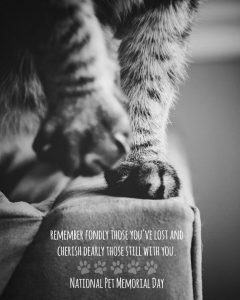 Established by the International Association of Pet Cemeteries and Crematories, National Pet Memorial Day in an annual event held on the second Sunday in September, to honor our pets both past and present. It’s also a great time to think about and share with others the important role that beloved pets have played and continue to play in our lives. This year’s event will take place on September 10th. Pets bring an abundance of joy and companionship to our lives, and they teach us many valuable lessons along the way. They don’t care what type of mood we are in or how we look. They are completely non-judgmental, and they are loyal until the end. These are only a few reasons why it can be so heartbreaking to say good-bye to a four-legged friend. The mourning process can be difficult, but it’s something we must face as pet owners. Plant a tree or a shrub as a living memorial. Sort through your photos of your pet and make a scrapbook. Frame a few of your favorite pictures to display around your home. If you saved your pet’s favorite toy, ball, or blanket, now would be a great time to revisit those items and reflect on the happy memories he or she once had with them. Make a donation or volunteer at an animal-based charity or rescue. Giving back to animals in need may help you in the grieving process. Talk to someone. Sit down with family, friends, or neighbors who knew your pet and share your favorite memories or stories together with them. Burn a candle so that your pet’s sweet memory will live on. One Fur All’s Furever Loved Memorial Candle is the perfect option to do so. It also makes a thoughtful gift for those mourning a cherished pet. The One Fur All Memorial Candle features a light and comforting fragrance that combines an array of floral and citrus scents balanced with a hint of citrus honey and golden vanilla. In addition to the pleasant and calming fragrance, the candle has a colorful and decorative design, making it visually appealing and a nice home accent. Similar to all candles available at One Fur All, the Furever Loved Memorial Candle is specially formulated to freshen pet-loving homes and is made with 100% natural soy wax. It’s also made with an odor neutralizer and infused with their signature blend of essential oils. Some other beneficial features include: 100% cotton wick, hand-poured, dye-free wax, contains no parafifin/petroleum by-products, and It’s made in the USA. The candle has approximately 60-70 hour burn time and the jar can be reusable (reused or repurposed). Satisfaction guaranteed. Retail Price: $21.95. Regardless of how you decide to celebrate September 10th’s National Pet Memorial Day, there is no wrong way to honor a pet. This year, take a few minutes to sit down and think about the wonderful animals that have enriched your life. For those who are celebrating a pet who is still alive, be sure to give them a big hug and some extra love and attention on this very special occasion. This entry was posted in Pet Holiday and tagged National Pet Memorial Day, One Fur All Pets on August 28, 2017 by Rebecca Symon.